Hello sweet friends, old (that have been here more often, rather) and new! acclimated to our home, her school, this America. To read more about her, go HERE. I pray you are having a wonderful day! Let's remember that our first duty is to our own family, in her own household. our first task, our most important job, and our true career! We are blessed, so very blessed. The changes of season is coming upon us and it's time for a new wreath, right? And couldn't think of what that would be. Until I remembered the "box". met me for a visit at Starbucks here in town. When our visit was over, she gave me a box of cool stuff she wasn't needing. In it were two ceiling medallions. 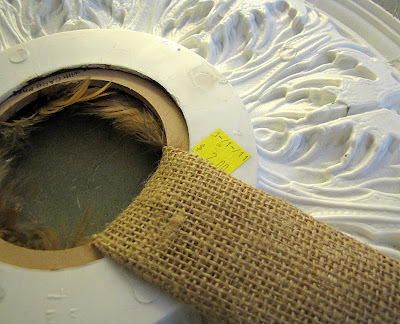 Instead of hanging this one on the ceiling, I decided to make a wreath with it. At Michael's, I found a round craft ring/wreath form. And some picks wif wots and wots of fedders. 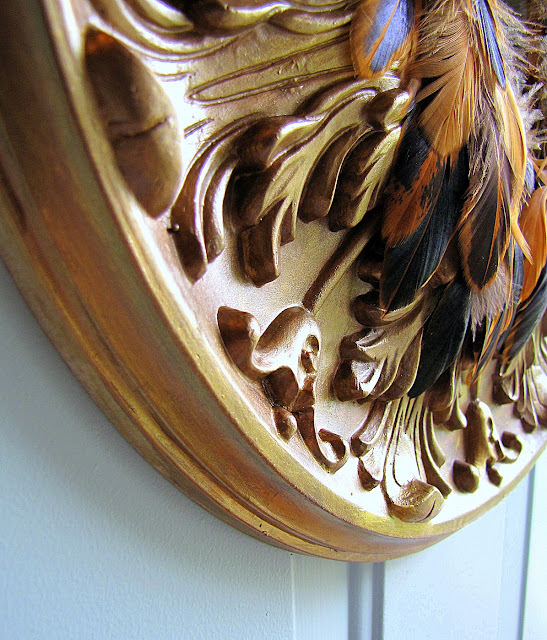 Miss S painted the medallion a loverly shade of bronze-gold. I hotglued my fingers a long strip of burlap to make a hanger. Attached that puppy to the medallion. Not something I'd normally make, but I'm wild and crazy like that sometimes. 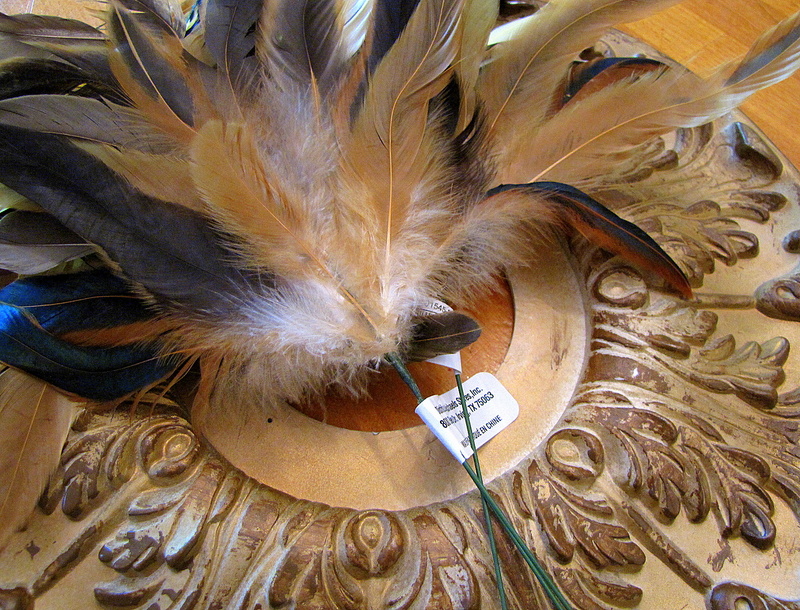 My favourite feathers are the blue-green ones. God sure makes some beautiful things. I had fun with my daughter creating something unique. when my front door was red. (Now it's Wythe Blue, Benjamin Moore hc-143). 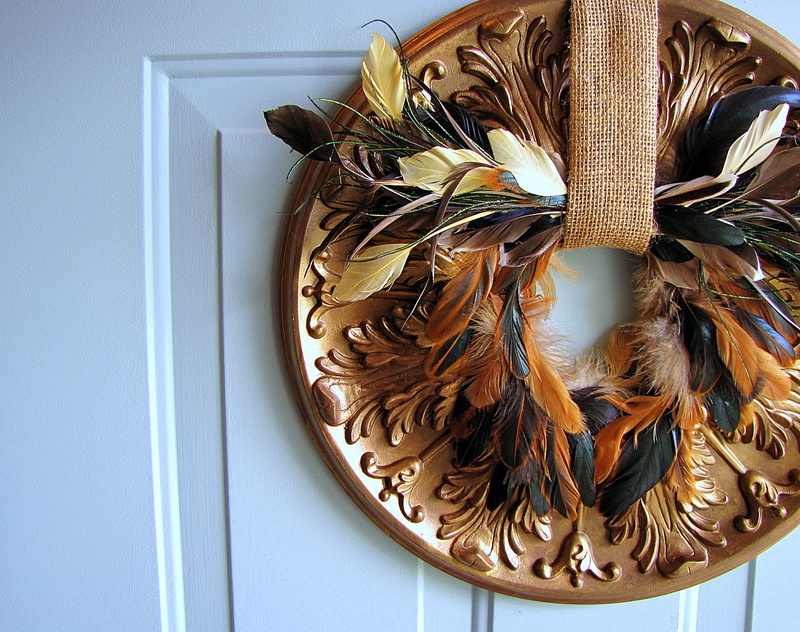 Have you made a wreath yet and started to think "Autumn"? 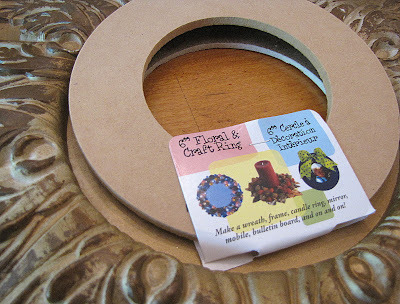 What can YOU make a wreath out of? You might think its weird, I think its cool and really original. Isn't it the best when you get to create with your girl? I know it is for me. I like it! It is very Fallish I think. Last year while I was raking up all the leaves on our huge Magnolia tree I decided to make a wreath...I glue gunned all the pretty leaves of so many colors onto a form...it was time consuming but it turned out really pretty! I don't think it is weird at all. I think it is lovely and cool. I love those feathers and that you thought outside the box. It's beautiful!!! 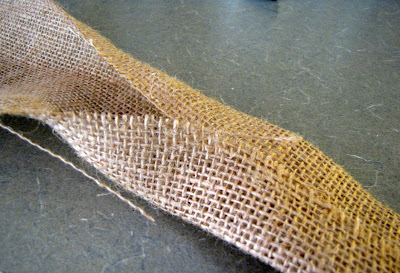 Love making things from unusual items!! Ok, Leslie, that is seriously awesome! I don't think I ever would have thought of that but I have a feeling you are going to be seeing knock-offs popping up all over blogland. :-) It looks beautiful! I love this! 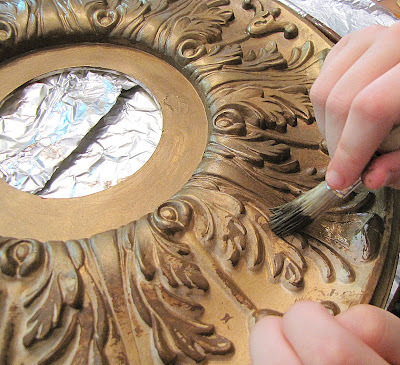 What a great way to use the ceiling medallion. The feathers are just wonderful. It's one of my favorites at the Nester's Link party. 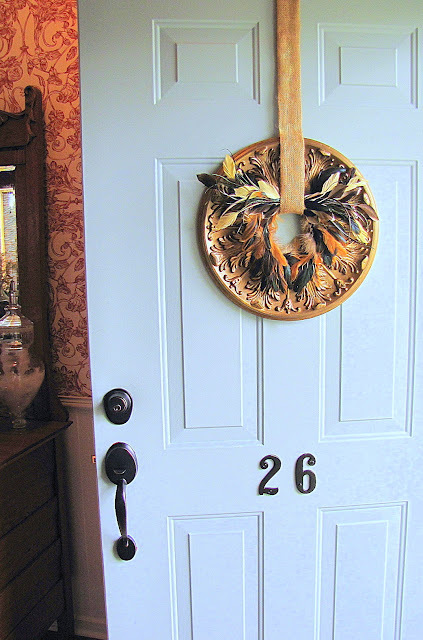 How pretty..what a great idea..
A different take on door wreaths.. 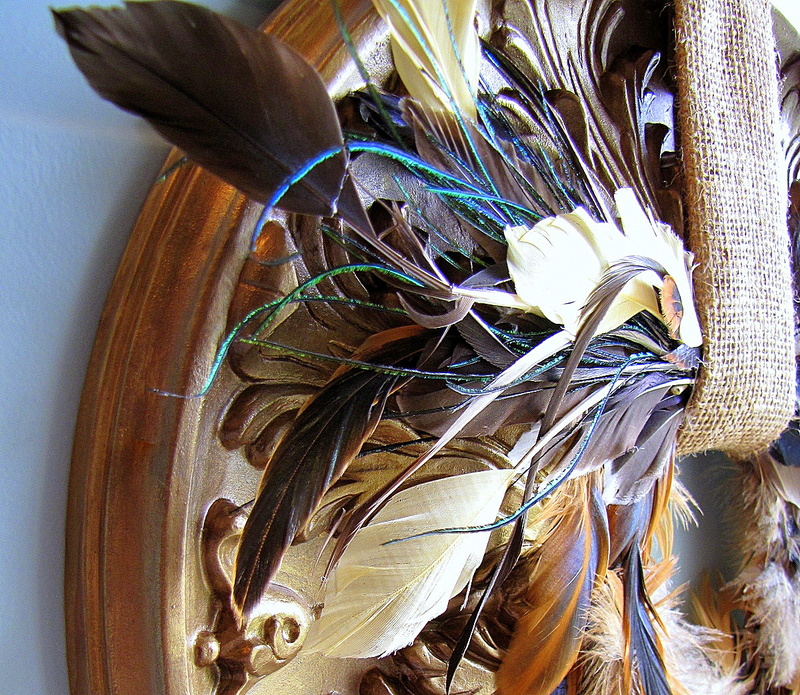 I am lovin the feathers!!! I love it Leslie! It's really cool! How is Lovely getting along with you all? Well, if that don't ruffle your feathers...then I don't know what will! lol! This is so different but so elegant! I love feathers in the fall... and they contrast beautifully against the gold. Very cool...I like the weirdness :). I've missed you on here, but admire you for putting first things first! We've had a cold front that makes me want to break out the autumn....but I'm holding off for a few more weeks (at least I'm going to try). i'm unique? anyway, i think that the finished product looks positively beautiful, mother! I love tin panels (even the plastic ones) and we're thinking about incorporating them into our kitchen. Simply stunning! I have a ceiling medallion that I've been using to decorate with. And I was trying to think of a way to make a wreath out of it. Low and behold, you made a beautiful one! Thanks for sharing. I just love it! it caught my eye right away - very stylish! I think it's gorgeous -- very elegant! Leslie, that is very unique and I like unique. Love what you did to that medallion. Now that is thinking outside the box. Thanks for sharing at Wow. I really love this. All of it. Wow! That is soooo beautiful and cool! 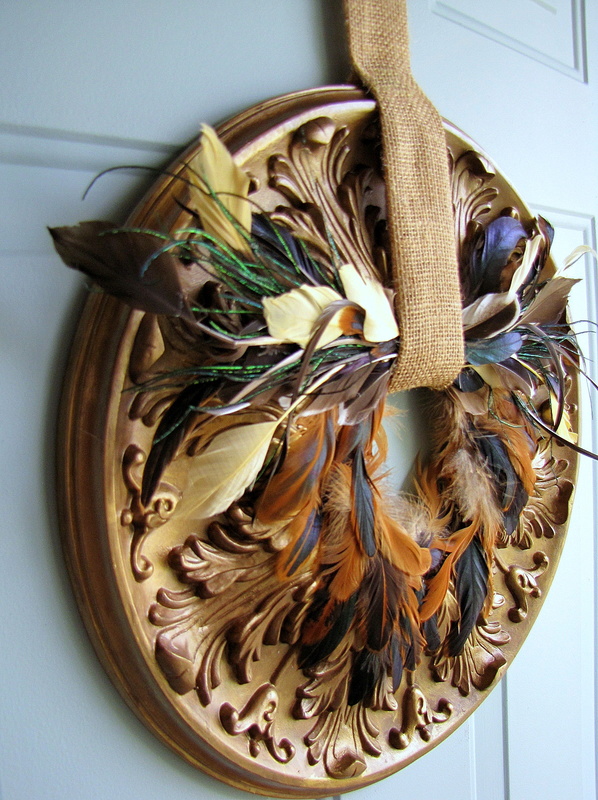 Love creativity and this wreath is inspiring. Good luck with your new exchange student. This is amazing! 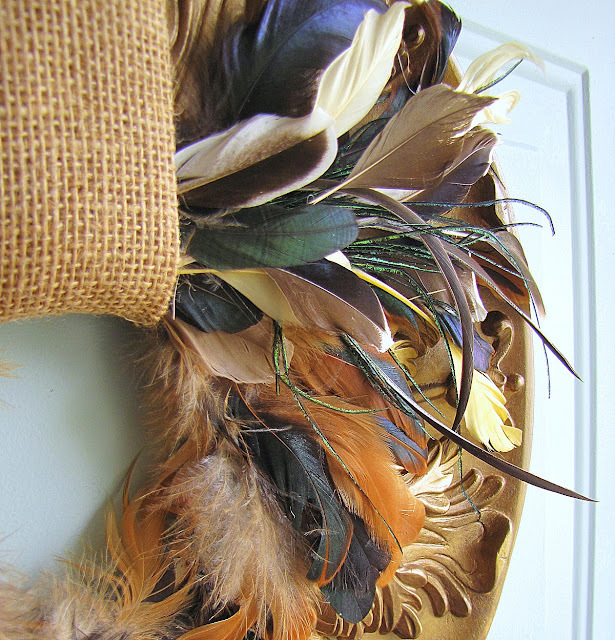 I'm loving feathers for fall right now, but just wasn't sure how to use them--this is perfect! Love all the color tones. And, yes, God did make some pretty gorgeous creatures. I like your wreath. I think it's weird that you use baby talk on your blog though.